Combine all #1 ingredients and mix thoroughly. Knead on a lightly floured surface. Set aside. Combine all #2 ingredients and mix thoroughly. Knead on a lightly floured surface. Roll each dough separately to a 1/8 inch thickness, into rectangles. Lightly brush a little water over the top of the light dough. 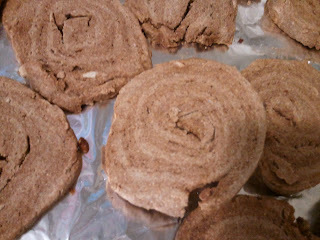 Place the dark dough on top, then roll up like a jelly roll. Wrap the roll in plastic and chill in the freezer for one hour. Cut the roll into 1/4 inch slices. Place them on a cookie sheet sprayed with non-stick spray. Bake at 350 degrees for one hour. ***The dough was a little too dry so I added a little more water until they mixed better. Next time I will probably only cook them for 45 minutes. They are SO hard you can hardly break them apart. The dogs don't seem to mind though.